Solidarity sends warrant to have Motsoeneng's assets seized - SABC News - Breaking news, special reports, world, business, sport coverage of all South African current events. Africa's news leader. In 2017 the Labour Court found that Motsoeneng should be held liable in his personal capacity for the legal cost emanating out of a court case relating to his controversial ban on the broadcasting of protests. 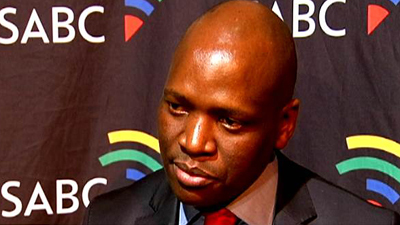 Trade union Solidarity will now serve former SABC COO Hlaudi Motsoeneng with a warrant of execution to have his assets seized. The union says it received confirmation from the Supreme Court of Appeal that Motsoeneng’s leave to appeal has been dismissed with cost. In 2017 the Labour Court found that Motsoeneng should be held liable in his personal capacity for the legal cost emanating out of a court case relating to his controversial ban on the broadcasting of protests. The ban resulted in the unlawful dismissal of eight journalists who were opposed to the decision. Solidarity’s legal department’s head Anthon van der Bijl says they going after Motsoeneng’s assets. “Yes property or anything of value at the end of the day. We think Mr Motsoeneng has a few properties registered in his name. So I think an amount of R1.1 million is quiet a large amount. We assume that property will be one of the first things we will look at,” Van der Bijl says. This entry was posted on 07 Jun 2018,12:10PM at 12:10 PM and is filed under Politics. You can follow any responses to this entry through the RSS 2.0 feed. Both comments and pings are currently closed.